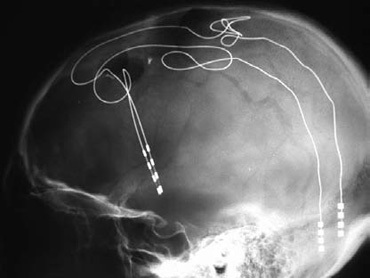 As I write this, I know that tomorrow, I will be caring for a patient in whom a neurosurgical colleague will be placing deep brain stimulators for Parkinsonism. The patient will be somebody who has such severe, medication resistant, brain-mediated joint rigidity and muscle tremors that going out to dine is more-or-less out of the question. Most of the people so afflicted avoid being seen in public at all. He will come to us, willing to undergo brain surgery while wide awake, in the hope that we can alleviate his disability. Sometimes the results are miraculous. Sometimes not. 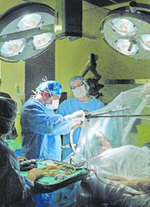 So called "functional" or awake, neurosurgery is performed for a variety of reasons. Usually, it is because the procedure requires the active participation of the patient in pinpointing areas of the brain; speech, motion and such. Normally, I have a cart full of drawers full of vials full of clear liquids with magical properties that allow me to modulate (and most typically abolish) my patient's perceptions, memory, and consciousness, and thus, overcome their pain and suffering during surgery. But I don't get to use them here. (Well, the liquids would be magical, except our understanding destroys the magic; "Mark Twain's experience comes to mind, in which, after he had mastered the analytical knowledge needed to pilot the Mississippi river, he had discovered the river had lost its beauty." -Zen and the Art of Motorcycle Maintenance, Pirsig. (see also Sleep and Death are brothers). We do some things to make it better, my favorite being the use of a clear plastic sterile drape that goes straight up from the patient's forehead. We used to use a mayo stand above the patient's face, but this is better; they can gaze up at the OR lights or around at the Stealth surgical navigation computer (more magic) at the foot of the room-less claustrophobic and isolating. The awake part can last two or three hours for a Parkinson's procedure; less for essential tremors-the brain targets are bigger. These cases are professionally challenging in a different way from complex cardiac or neuro-vascular. Low tech/high touch. At the end I am invariably emotionally exhausted, and need a break for 30 minutes or so to recharge. Maybe because I know that I have more years behind me than in front of me (and they zoom by now, instead of crawl), but I find that the boundaries between me and the patients I care for are blurring. Maybe the Zen instruction, "don't compare, identify" has finally seeped in. I don't know. But I do think that almost three decades in practice has knocked some sense into me. Sometimes, I think that the lesson of the crucifixion of Christ is that really, we're all in it together, bound by our shared common mortality. The complete Kerouac quote, by the way is "And now left to die and disappear in their own way into the common dark of all our deaths." 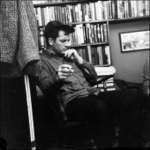 If you want to see Kerouac reading it, go here. Terrific post. Nice mix of the scientific and the personal. I wish all anesthesiologists held such a responsible view, but we all know there are all kinds. Wow, that was a fantastic post. Thank you for holding your patients hands as long as they need it. Probably the best anesthetic in your arsenal. Very nice post. Sure glad you are there no matter which side of the table I happen to be on.